It is a very special time for expecting mothers. While new mothers take special care of their babies, it is essential for expecting mothers to also care for the development of their baby while inside the womb. 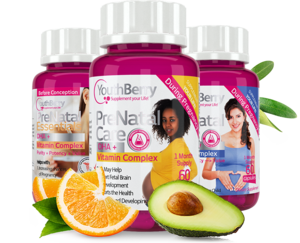 YouthBerry’s Prenatal Health supplements are 100% safe for both the babies and the expecting mothers. They provide the essential nutrients for a baby’s development inside the womb, as well as providing the mother’s body the support it requires. Research shows that healthy DHA levels in mothers during pregnancy and lactation support optimal brain and visual development in babies. YouthBerry’s PostNatal Breast-feeding Support provides mood support for mothers before, during, and after pregnancy in small, easy-to- swallow capsules. Meeting your nutrient needs before and during your pregnancy is important to help support a healthy pregnancy and the baby’s development. 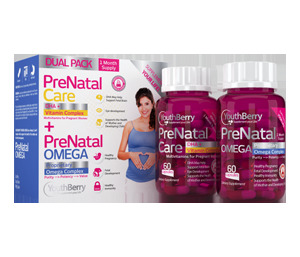 YouthBerry’s PreNatal Essentials is created specifically for pregnant and nursing women who want to pass on the benefits of DHA to their baby in a non-fish formula. Our formulation helps support a baby’s developing brain and vision. 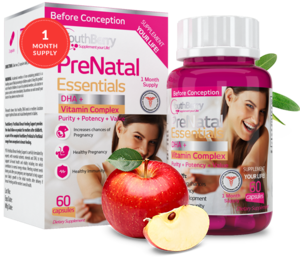 YouthBerry’s PreNatal Essentials use exceptional purity molecularly distilled technology to remove any contaminants including heavy metals and other impurities. Meeting your nutrient needs before and during your pregnancy is important to help support a healthy pregnancy and the baby’s development. 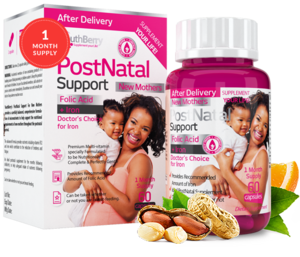 YouthBerry’s PostNatal Support Plus provides key vitamins and minerals for daily nutritional support before and during pregnancy in one easy to swallow capsule and is clinically proven to ensure absorption of key nutrients. Provides essential vitamins and minerals including folic acid, magnesium, iron, and vitamin D which may help support fetal brain and eye development. Meeting your nutrient needs before and during your pregnancy is important to help support a healthy pregnancy and the baby’s development. PreNatal Care: It is never too early to start taking care of your baby — and there’s no better time to start than before your baby’s conceived. Luckily, there’s nothing easier or more effective than taking a prenatal vitamin. This daily pill is an insurance policy, offering you the security of knowing that your body is stocking up on the most essential baby-making vitamins it needs to conceive and nourish your baby-to- be through a healthy pregnancy. PreNatal Omega : This is part of a perfect combo for you and your baby's health. It is highly effective, with all the right essentials that you and your baby would require. It is a thorough means for a healthy baby and a healthy pregnancy.